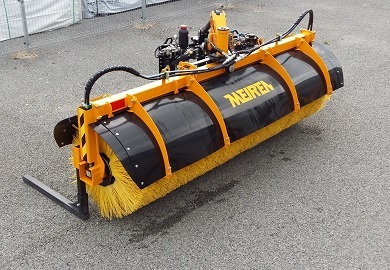 New sideshiftable, N-series rotary broom HT is a street cleaning brush, designed for use on highways, but is also suitable for cleaning city streets. Innovative aspect of the brush is its sideways shifting solution, which gives you an additional option to operate the broom. The sideways shifting and floating are both hydraulical, sideways tilting is mechanical. New VDP2504 snow plow for SUV, light truck and small tractor. 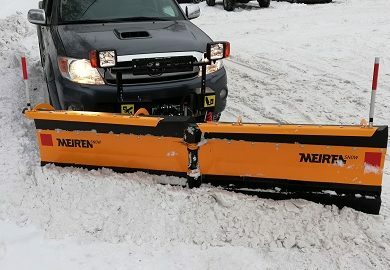 Thanks to the unique „noise reducing” blade holders, is the new VDP snow plow perfect for working in towns or in villages, for cleaning light traffic roads, parking lots, sidewalks and other narrow roads. 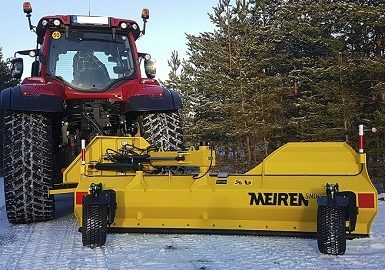 The new VTS03 series plows from Meiren combine all the essential and high-quality features. Simple external design holds into a well-thought-out product, with the keywords as unique, user-friendly, and best cleaning results. 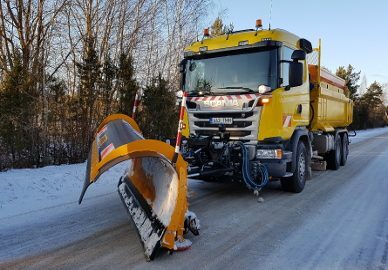 The new design ensures the best throwing performance for the snow plows on city streets, sidewalks, narrow roads and car parks etc. 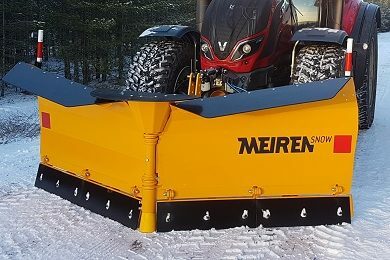 Snow plow TSL is durable, simple and low-cost snow plow that is designed for use with tractors.The snow plow can also be used on small wheel loaders and is suitable for cleaning of pavements, parks and smaller side roads. 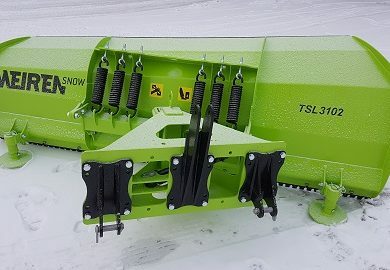 The new snow plow TSP02 combines the best features of the two previous generation snow plows of TSP03 (cylindrical) and TSK03 (conical). Plows are suitable for working at city streets, light traffic roads, parks and smaller side roads. Thanks to the wider range of extra equipment, the new TSP02 can now be assembled according to the customer's wishes, either cylindrical, conical or both sides double throwing, model Twincone. 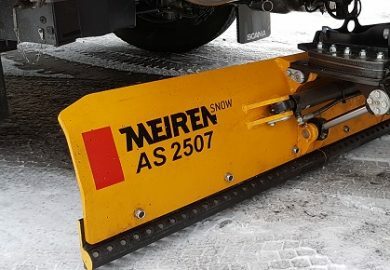 Rear blade TRN is the new snow removal equipment in Meiren Snow product range. Multifunctional 3-in-one rear blade with sideshift solution can be used in both winter and summer season. In the winter the plow can be used as side plow to enlarge the total working width. 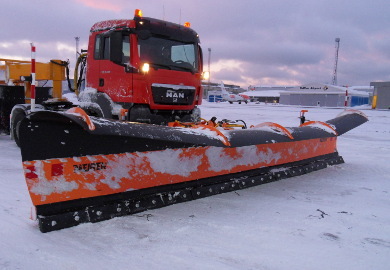 In summer the plow can be used in road maintenance. The rear blade can be used stand-alone, without additional front plow rear of the tractor. 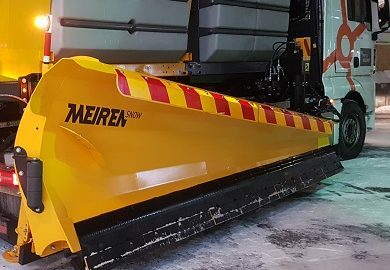 Airport snow plow LES 8603 is the biggest heavy duty unit in the Meiren Snow's snow removal equipment collection. 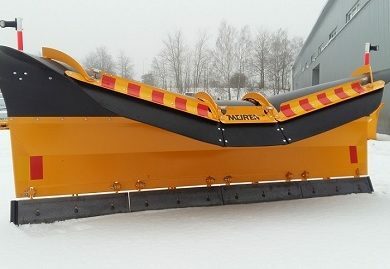 9 m wide plow has a foldable mouldboard, drop-and-grab quick hitch and a very unique design. 28 elastomer blade holders maintain maximum contact with the surface. 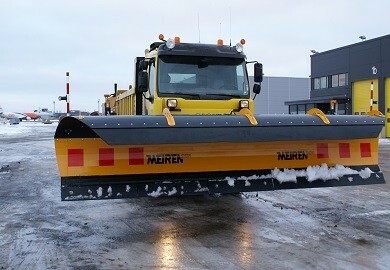 Meiren Snow airport snow plow LES03 is a double blade plow ensuring extremely clean plowing result on the runways. Polyurethane blade holders are maintaining uniform pressure to the surface and spare runway lightning from unnecessary wear and tear. 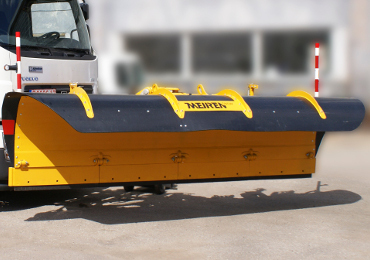 Hydraulically operated extra blade mechanism (LH) collects effectively rest of the snow. 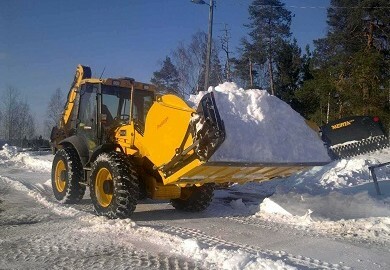 The foldable snow plow is specially designed for powerful wheel loader to remove a large amount of snow. It is a perfect tool to operate at airports, car parks or other wide areas. 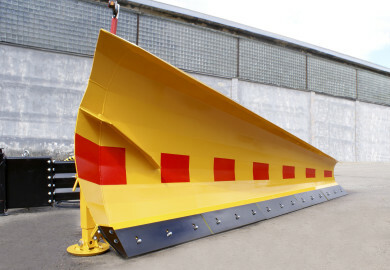 The snow plow can be equipped with rubber or steel blades. It is made of ductile cast steel and finished with epoxy paint. Before painting the steel details are processed with steel-grid blasting. The internal wings are operatable 35 degrees back or forward. The outer wings are foldable up to 90 degrees forward. Snow bucket is designed for remove and transport snow or other lightweight materials. 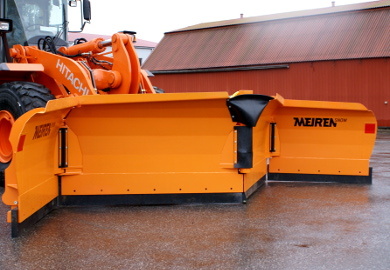 As an extra equipment the snow bucket has side flaps and they are designed to collect snow at the ground and due that enlarge the working width of the bucket. 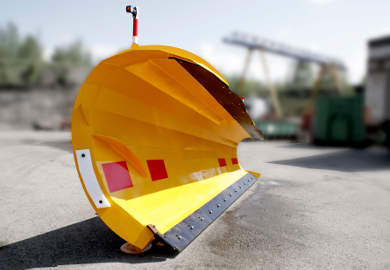 If the side flaps are not in use, the snow bucket should be equipped with edge protection.